I almost always choose species plants when adding wildflowers to the garden. They're of hardier stock and can take the tough conditions dished out by Clay and Limestone! What I didn't tell you was that three Coreopsis BIG BANG™ 'Redshift' and one Eupatorium dubium 'Little Joe' came home with me that day. Thank you Darrell Probst for this fantastic cross of threadleaf and grandiflora coreopsis! It took you 8 years of intensive breeding and the crossing of 8 species of Coreopsis to get 'Redshift', but, it only took me one season to fall head over heals in love with it! I can't sing its praises enough. It's been blooming since summer abruptly replaced spring and it just made sense to add more. Even the drought didn't stop it! It needs full sun, good drainage and daily deadheading of spent flowers. Granted, two of those are hard to get at C and L; so I planted it in a container, in the best draining soil, in the sunniest spot in the Susan's border! It rocks out there! But, that's not all. In my garden it was lovely buttery yellow with a hint of red during the hottest weather, but, when the rain moved in and the temperatures dipped to the 70s it shifted to a deeper red. The name, 'Redshift' sure makes sense! That leaves the Joe-Pye! Just look at that budding beauty! Who could turn that face down! The pollinators won't either! Inspired by the words of Elizabeth Lawrence, “We can have flowers nearly every month of the year,” Carol of May Dreams Gardens started Garden Bloggers Bloom Day. 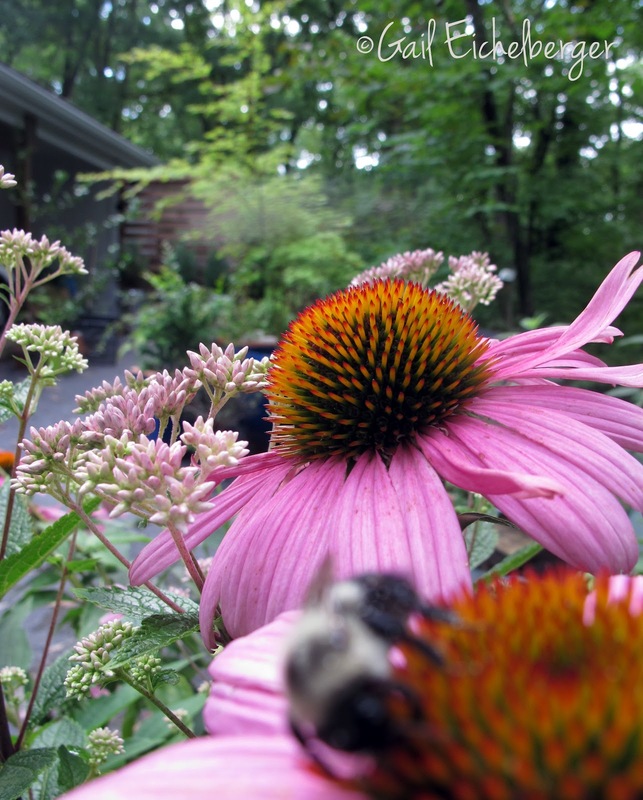 On the 15th of every month, garden bloggers from all over the world share their garden blooms. So head over to Carol's to take the Mr Linky magic carpet ride to more gardens than you can imagine visiting in one day! This is my July 2012 contribution. Gail Eichelberger is a gardener and therapist in Middle Tennessee. She loves wildflowers and native plants and thoroughly enjoys writing about the ones she grows at Clay and Limestone. She reminds all, that the words and images are the property of the author and cannot be used without written permission. Such good choices dear Gail. The Coreopsis is so beautiful, and you are very clever planting the pot! 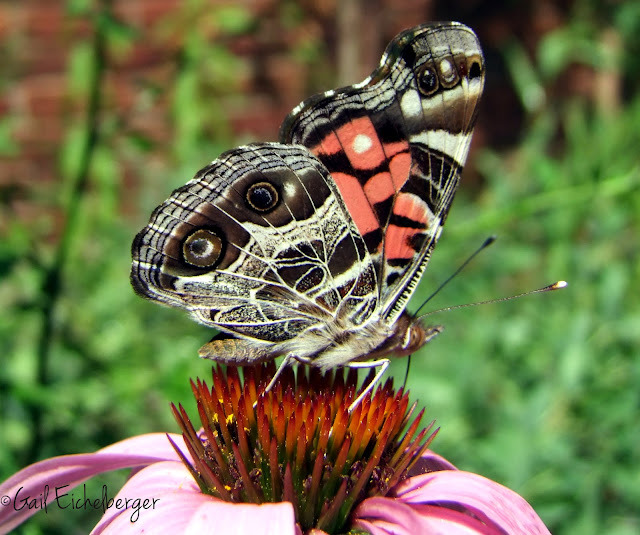 The pollinators adore your garden, such beauties! I will have to pick up some of that 'Red Shift'. I like it and who doesn't love a flower which has the ability to morph into a different look. I love the 'Redshift'--what a beauty! It's obvious the pollinators are enjoying all your blooms this Bloom Day, Gail. 'Redshift' is gorgeous, Gail! Our species Joe Pye weeds are acting more like dwarfs this year with the drought and heat. I've noticed quite a few plants here are shorter than usual, some are half their normal size. Your garden looks beautiful in spite of the heat! You don't mention what that first flower pictured in the post is. I like the almost ferny texture of the stamens. Thanks for the recommendation on Redshift. OOooooo That Redshift realllly looks/sounds good. I will have to see if it is available around here. I need a trooper like this in the garden. I think it sounds almost unanimous...that Redshift if wonderful! Thanks for the back story...I find that so interesting. I've never liked Gallardia, its colors are too garish for me. (I know, you never thought to hear that from me!) But that all yellow one is lovely. Don't worry, I won't report you to the "species only" police. There is a place in the garden for quality cultivars of our native favorites. I love that Corepsis RedShift, and I have Little Joe in my garden too. Mine are nowhere near to blooming yet though. We need a little more warmth and sunshine. My daylilies and other lilies have just started. Those are some of my favorite Echinaceas too. I'm planning to put in a drift of them this year, but not until our rains come back, so I won't have to water them. I think I have tried every new cultivar of Echinacea that has been released, and I especially am drawn to the orangy melon ones. I can state with complete confidence that all are gone, except for the the plain old E. purpurea which grows in spades here. Bummer isn't it! They just haven't the vigor of the species! Horizon Herbs carries the seed for several echinacea varieties. I have winter sown purpurea and it is hardy and grows quite well. I'd love to try the tennessessis (sp) but I hear it's a bit trickier to grow from seed. Any experience? Lovely flowers, Gail! I think Red Shift died out on me, not sure why! Since all these flowers are temperate climate dwellers, i just see them in pictures and in blogs. I appreciate all of them, of course, but i love better that butterfly! hello Susan, I hope you start blogging so we can see your garden! What an inspiring post! I am absolutely smitten with that Coreopsis. I wish our summers were dry enough for Coreopsis and Echinacea to grow well here. Lovely photos especially of your pollinators Gail. Wow, look at all those pollinators! 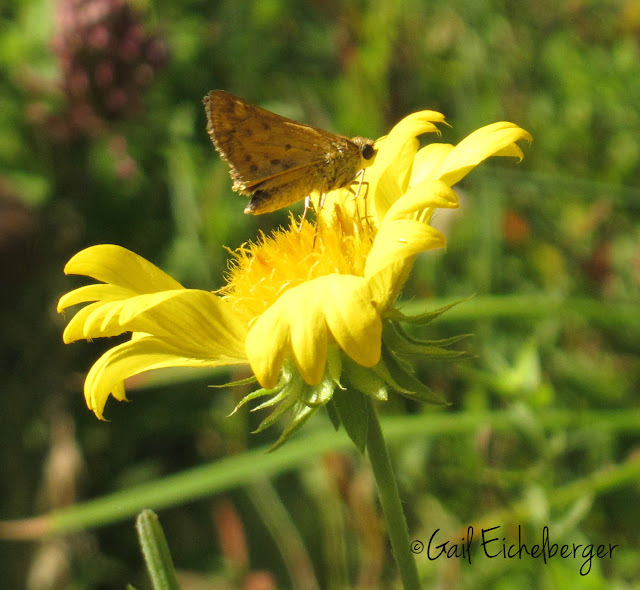 That's what struck me in your photo of the Coreopsis blooms. I noticed tons of pollinators on my flowers this evening after work--I think the new rain must have unleashed a ton of pollen that was just waiting to be released. Your Joe Pye plant is looking great! My, your photos are getting more beautiful all the time, Gail! You are getting rain... please send a little up north! It's so dry. I worry because our hottest weather is usually mid- to late-August. And we've had weeks of 95 to 103 degrees since mid-June. Very Little rain. Uncanny. I have gotten all of those coneflowers, except for the last one you named. I think I still have a couple 'Magnus'. I'm not sure about the others, as they have bred with each other and the plain purple coneflowers, as well as the 'White Swan', 'Harvest Moon', and 'Kim's Knee High'. I think I may have that coreopsis, too. I got a couple plants on sale last year with no tags at all. I thought they may be coreopsis, but wasn't sure. I'm glad one of them is doing well this year. It also has that touch of red in the center. Heidi dug the other one out. She has made a mess of most of the plants in the back yard. I like the coreopsis Redshift you have here. I have Zagreb and Moonbeam and will look for Redshift. My coneflowers never do that well, and I hear that from many others in our area. They live, but do not multiply much, and I love the pollinators they attract. Lovely images Gail, seeing the plants and all their friends. More and more I am turning to the inspiration, and knowledge of gardeners like you, those who have difficult situations to garden in. With the thought that if it can grow in your garden, it might be fine in mine. Thanks for the inspiration, and I am putting coreopsis Redshift on my list. You take such beautiful pictures of your chosen plants. I wish I could get coreopsis to succeed well in the summer here. I still have the one from Seattle but it is just not liking this humid summer. The only cultivar of echinacea I have tried is the white, white swan. It has re seeded for me which I am more than happy about. Just beautiful!! I imagine being in your garden would like listening to a buzzing symphony. arises. The above information helps you to choose the better one that suits your requirements.